Having finished my Italian language course, I invited all my classmates over for a big finale meal. As most of them are English, I thought some really traditional Italian food would be quite fun. Timballos vary in name and recipe between Italian regions but the general idea is that a big dish or mold is lined with grilled auberines or pastry. It is then filled with pasta or rice bound with rich tomato sauce, eggs or cheese along with a myriad of other savory tidbits like beef, meatballs, mushrooms, sausages, chard or truffles. After baking in the oven and allowing to set on the side a while, you are left with a rich, heavy and tasty meal to be washed down with copious amounts of vino. 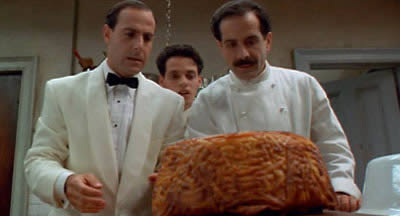 The mammoth Silver Spoon cookbook has a whole chapter of timballo recipes that I will no doubt work my way through now I have dispelled the myth that this dish is only appropriate for when royalty visits. As I was cooking for a lot of people and I had never made a timballo before, I put in quite a bit of research, finally settling on a recipe by the rather beautiful Giada De Laurentiis, an American Italian chef. The original recipe I used can be found on foodnetwork.com but as I had converted all the measurements for I thought I would retype it here, along with my notes and amendments. This recipe is not an exact science so it will happily accept an extra this or that. I didn't get a picture of a cut slice of the timballo as I had lots of waiting guests but it did look like the one on the recipe link - I promise! The quantities below will serve 6. I doubled it up although there was too much filling for the aubergine lined molds which was no great shakes at it was reheated the next day for a well needed hangover cure. You need a 9-inch springform pan. Make a simple tomato sauce by gently frying an onion in olive oil until transparent, then adding 2 tins of tomatoes and about 500g of sieved tomatoes/passata, a splosh of red wine and seasoning. Cover and allow to simmer for at least 30 minutes, 45 is better until thick, rich and reduced. Place a griddle pan over medium-high heat. Using a pastry brush, lightly brush the aubergine slices with olive oil and sprinkle with salt and pepper. Grill the aubergine until tender and colored with grill marks, about 4 minutes per side. Set aside. This is the worst of the work so stick some tunes on and accept you will be by the cooker for a while. Bring a large pot of salted water to a boil over high heat. Add the pasta and cook until tender but still firm to the bite (really, really important) stirring occasionally, about 8 to 10 minutes depending on your pasta. Drain pasta. Meanwhile, warm the 2 tablespoons of olive oil in a large frying pan. Add the onion and saute until tender, about 3 minutes. Add the beef and sausage and brown the meat, breaking it into bite-sized pieces with a wooden spoon, about 5 minutes. Add the Marsala and cook until the liquid has evaporated, about 3 minutes. Turn off the heat. Add the peas and tomato sauce and stir to combine. Add the cheeses, basil, and cooked pasta. Set aside. Preheat the oven to 175C. 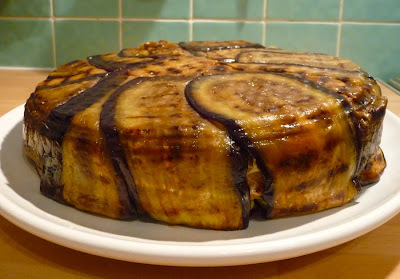 Line the springform pan with the grilled aubergine. Be sure that the slices overlap and hang over the edge of the pan. Fill the pan with the pasta mixture, pressing down to make sure the pan is filling up evenly. Fold the aubergine slices up over the top of the pasta and add a few more slices on top to completely enclose the timballo. Bake the timballo until warmed through and the cheese has melted, about 30 minutes. Let rest on the counter for 10 minutes to set. Breathe deep and invert the timbale onto a serving plate and remove the springform pan. Sprinkle the remaining 1/4 cup grated Pecorino Romano cheese over the top. Slice and serve with extra tomato sauce on the side.